Marvell today announced its game-changing fifth generation serial advanced technology attachment (SATA 6 Gb/s) solid-state drive (SSD) controller. The industry-leading Marvell 88SS1074 SATA SSD controller deploys Marvell's third generation NANDEdge error-correcting, low-density parity check (LDPC) technology, facilitating use of 15 nm triple-level cell (TLC) NAND flash in client and enterprise SSDs. The advanced SATA SSD controller significantly improves total storage system cost and delivers unparalleled performance with lower power consumption. "As the inventor of a wide range of leading storage technologies, we are very proud of our innovation, leadership, and contribution to the advancement the of storage industry. I am thrilled to see our highly differentiated and advanced LDPC technology continue to raise the performance bar of robust storage solutions. I believe our efforts will enable top global OEMs and partners to accelerate the deployment of the fast growing SSD market," said Weili Dai, President and Co-Founder of Marvell. "I am very thankful for our dedicated and innovative engineering teams for once again delivering game-changer storage solutions. At Marvell, it is our pride and long term commitment to invest in the most innovative technologies to serve the storage industry and offer the most reliable and secure cloud solutions. Our mission is to drive innovation for better lives for all in the new era of 'Smart Life and Smart Lifestyle'." As process geometries continue to shrink and NAND flash technology migrates from MLC (2-bit) to TLC (3-bit per cell), high reliability, uncompromised performance and low power consumption are critical for the widespread adoption of SSD. The game-changing Marvell 88SS1074 delivers all of these benefits to SSD manufacturers, enabling the next generation of storage systems. Marvell's NANDEdge advanced error correction LDPC technology has been evolving through generations of in-house data integrity designs for hard disk drive and networking applications. Compared to existing error correction technology, NANDEdge provides more than three times the error correction capability and is well suited for new TLC/MLC/SLC NAND flash memory up to 15 nm process node. 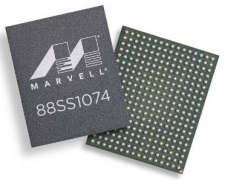 By leveraging Marvell's NANDEdge technology, the 88SS1074 controller delivers uncompromised performance while enabling superior NAND endurance and reliability, which are crucial for TLC SSD to exceed storage requirements. The 88SS1074 also consumes less power than existing solutions, making it one of the most power efficient SSD controllers on the market. Marvell is raising the industry standard by powering the deployment of 3-bit NAND through highly differentiated SSD controllers. The 88SS1074 is currently sampling to leading customers. Marvell's fifth-generation SATA SSD controllers are an ideal solution for the rapid development of high-performance, low power SSD systems in a wide variety of applications from mobile to enterprise and continue to be the product of choice for leading OEMs. Marvell's latest SSD controller technologies will be showcased at COMPUTEX, being held June 3-7, 2014, at the Grand Hyatt Taipei, Residence One.